Welcome to the release thread for the NLSC current roster updates, as well as anything else that I release. I very rarely dabble with face patches (so please don't send me any requests!) but I've been trying out a few conversions of cyberface files from old games as well as converting player faces for use as coach faces. 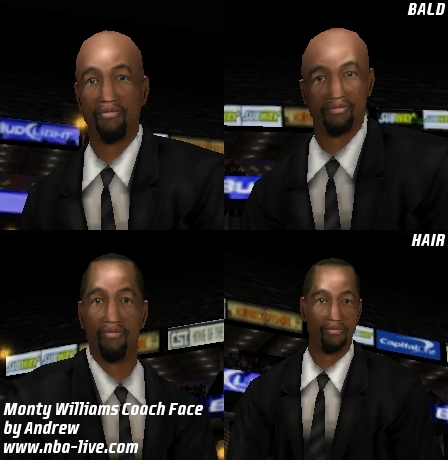 Using faces from NBA Live 2005, I've made what I hope will at least be passable temporary coach faces for Monty Williams (Hornets) and Mark Jackson (possible candidate for the Nets' vacancy), until more experienced face patchers make updates for them. Just a straight conversion of his NBA Live 2005 cyberface. The version with hair is a straight conversion of the NBA Live 2005 face, but I've also attempted to make a bald version. As I said, I very rarely try my hand at faces but hopefully they'll at least be passable placeholders until a more talented face patcher can provide updates for Williams (who has the Hornets job) and Jackson (should he leave ESPN for the Nets or another head coaching vacancy). Thanks, but I wouldn't go so far as to call myself a cyberface patcher. Aside from the attempt at making Williams bald, they're just conversions of EA's faces from NBA Live 2005, so they don't involve a whole lot of "craftsmanship", as it were. But again, thanks for the comments, as I said hopefully they can be passable placeholders at the very least. did Mark Jackson take a job already?? mind if i use ur converted Monty Williams for TUP10? I know, but like a Dynasty thread it was by design. Sure, feel free to use it. 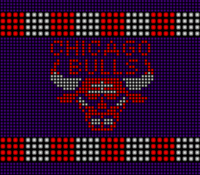 As for Jackson, he hasn't got a coaching job at this time (and may not end up leaving ESPN) but he's been rumoured for the Nets job and I thought if nothing else it might be a nice alternate if someone wants to customise their Dynasty. Andrew, damn.. those stuffs are awesome..
next, Tom Thibodeau and Doug Collins?? Thanks for the kind words. I'm not sure I'll tackle those other coaches since I'm not experienced when it comes to creating brand new faces, as I said those are conversions from NBA Live 2005 faces which is obviously a much easier exercise than a brand new face from a photo. I might give them a shot at some point, I like to dabble every now and again and see if I'm any better than I used to be with graphics, but for now those are the only coach faces I have in the works. looks like u'll have to convert Avery Johnson now too. 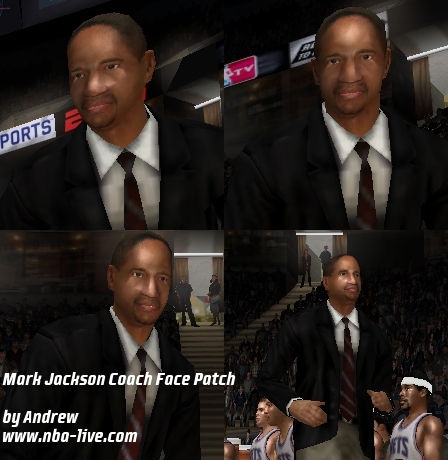 No need, Avery Johnson has a coach face in NBA Live 08 by default; PLAYERPKG is AVJOHNS. BTW,Thibodaeu has to be made too,if i'm not mistaken? Thanks, glad I was able to put out a couple of well-received releases. Thibodaeu does have to be made but as I said, making faces from scratch is a bit beyond me at this point. I might give it a shot at some point but I can't make any promises. It's not a new (or updated) release, but for archive purposes I've added my Sixers logo update to the first post. is this the previous arcade sound effects from 05? NBA Live 2004. NBA Live 2005's effects were realistic. I actually would've preferred to use NBA Live 2003's effects as you've got the booming sound effect on blocks which is perfect for an arcade mod, but the 2003 sound effects file causes 2004-08 to crash. Sir Andrew i might be demanding on this,but is there any chance u can provide a Logo wid wood marks on the playnow screen for the rest of the team logos?